Some call Chicago the Windy City; others refer to it as the Second City. The origins of the latter are debated, but it’s commonly held that the population growth of Chicago in the 19th century came in second only to that of New York City. Today, Los Angeles has replaced Chicago and bumped it down to third, but still, why does Second City sound like second best? This 24-hour city guide, sourced from the best and brightest of Chi-town, proves that the Windy City could be in the running for America’s number one. To find out why, read on. We usually prefer a coffee and a snack and then a late breakfast, but the name of this all-day breakfast place, “Little Goat Diner,” stopped us in our tracks. It’s a celebration of the modern diner, and chef Stephanie Izard of Top Chef fame serves up delish dishes like “Dark Chocolate Chip Crunch Pancakes” and “Bi Bim Bop Breakfast Bowl.” Chicago blogger (and Lemonader!) Katie Jefferson recommends heading towards the cool photo booth at the diner, and says brunch is a big deal in Chicago; we won’t judge if you come back for seconds later in the day. Chicago is one of those cities built on distinct neighborhoods, so sometimes it’s easier to pick one and hang there. But we’re in the 24-hour city guide business, so time is of the essence. And since we’re not big on playing tourist, our Chicagoan Lemonaders rounded up the “musts” of Chi-town. Take your pick, and then hustle over to lunch. Katie recs the world-renowned Art Institute of Chicago. Founded in 1879, their collection comprises of 300K works of art, ranging from ancient times to nowaday. Right next door is the Millennium Park, so if it’s a nice day, you can get some fresh air after wandering the exhibits. Depending on the time of year, Millennium Park can be more than just people-watching. In the summer, check out the concert, yoga, and movie night schedule; in the winter, head over to the free ice rink. Whatever you plan on doing, make sure you get to the Cloud Gate Sculpture, also known as the “Bean,” for an obligatory selfie. Designed by artist Anish Kapoor, the sculpture is made of 168 highly polished stainless steel plates – giving the appearance of liquid mercury – and the reflection captures the beautiful skyline of Chicago. Smile! Lemonader Ashton Swinford says her pick is the Museum of Contemporary Art, Chicago (MCA), a contemporary art museum downtown. With a lot of rotating exhibits featuring the art of our time, the MCA hosts both local and international artists, and the permanent collection includes more than 2,500 artworks that span media and movements from the 1920s to the present. A block over is the historic Chicago Water Tower. Probably the city’s most familiar and treasured landmark, it was originally built in 1867-1869 for the city’s municipal water system. It was one of the few buildings to survive the the Great Chicago Fire of 1871, so there’s a big chunk of significant history associated with it. Today, the Water Tower is also home to the City Gallery, the “city’s official photography gallery,” which presents Chicago-themed photography exhibitions by Chicago photographers. Admission is free, so just show up. 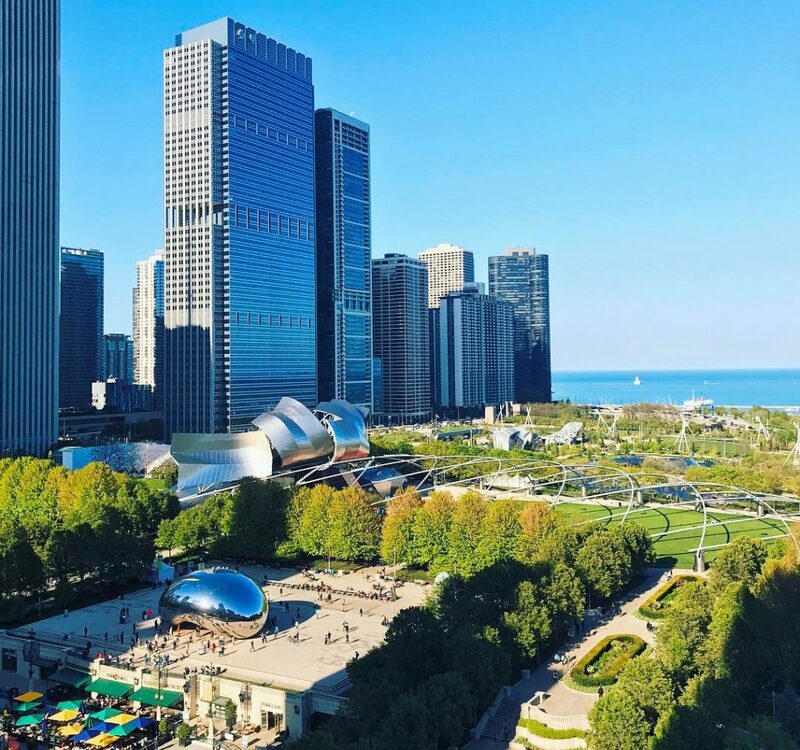 And if you just want to wander, take a stroll down the Magnificent Mile (also known as Michigan Avenue) to tourist your way through the city’s most famous buildings — the Hancock Tower, Tribune Tower, and Wrigley Building are all found here. Feeling stuffed from the carbs you just ate? Too much concrete jungle vibe? 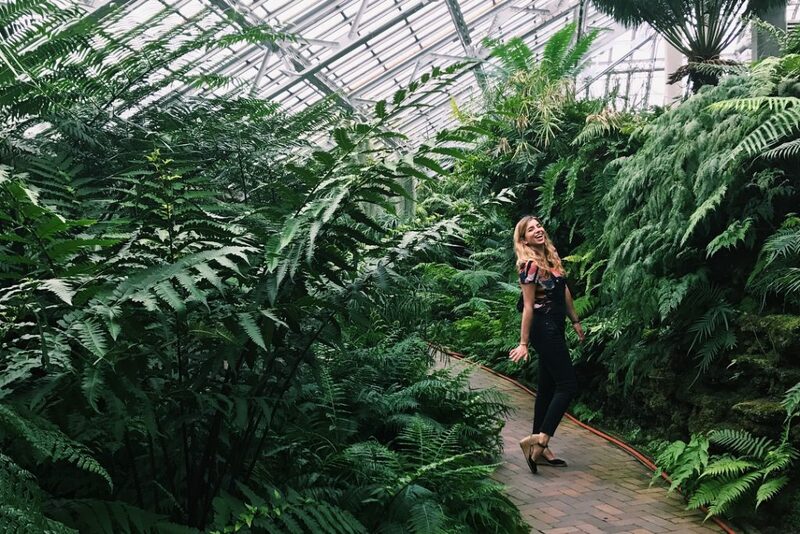 Next activity will help you with that: the Garfield Park Conservatory! Lemonaders Monique Montagnese and Shooka Rafizadeh both have this on their to-do list. Open 365 days a year and always free (suggested donation), this “landscape art under glass” will whisk you away from the city and straight into the tropics. Thousands of plant species are on display both inside and out, and there’s a bunch of cultural performances, hands-on classes, and educational demonstrations happening all the time. 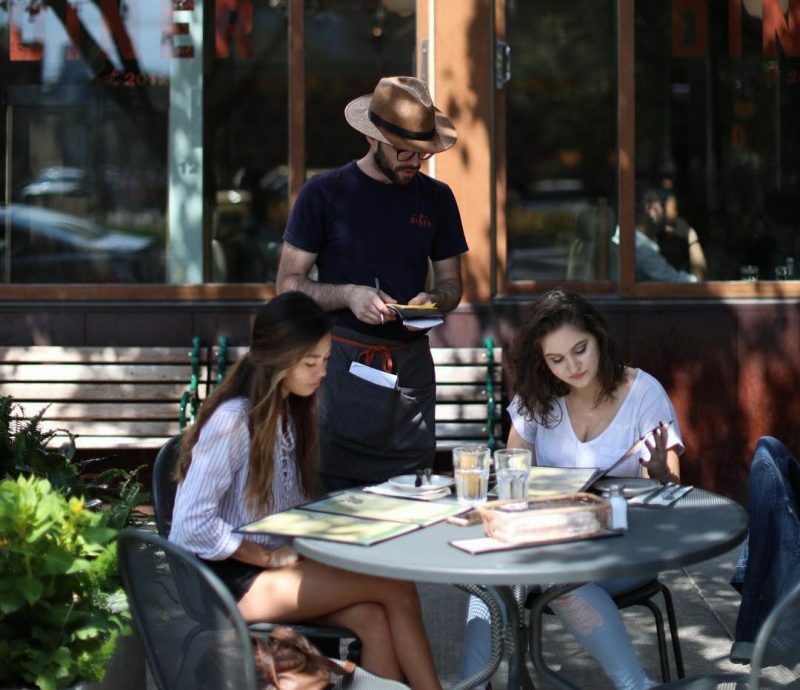 Choose another neighborhood to explore, or just follow Lemonader Monique Montagnese to the hipster neighborhood of Wicker Park! Off the tourist-y path, this neighborhood houses an eclectic mix of shops and cafes, so there’s really something for everyone. Stroll around the hood, but make your destination the Myopic Bookstore – a perfect place to get lost in. With three floors of books from the floor to ceiling, it’s one of those places that even if you have no idea what you’re looking for, you’ll leave finding something you never even knew you wanted. This ‘hood is chock full of fun stores to check out. Antique Taco is a hybrid between an antique shop and a taqueria (! ), which means you can snack on a taco and sift through one-of-a-kind finds. Sounds heavenly, right? Several of our Lemonaders pointed us to one direction. Yes, it’s back downtown in tourist central, and yes, the wait may be long, and yes, everyone’s there, but Cindy’s Rooftop Bar has one helluva view. Located in the Chicago Athletic Association boutique hotel, Katies says it’s one of the best panoramic glimpses of the city. Ashton told us we’d def need to make reservations, even if it’s just a drink! Cocktails can be pricey, but we gave you free activities all day just so your budget can go towards this view (priorities?). Luckily for Chicagoans, the city is known for more than deep dish delightfulness. In true American spirit, hamburgers are a big deal, and both Anthony and Katie recommend Au Cheval for a casual burger. As with any trending joint that has won national awards (hype! ), you can expect a really long wait, so Katie’s suggests putting your name on the list and head to Lone Wolf bar next door while you wait. If you’re looking to up your game, Monique says Avec is the place to go. It’s considered a Chicago classic, although it’s self-proclaimed as having a Mediterranean influence. Shared plates are the name of this game – Katie recs the bacon wrapped dates. Another one on our Lemonaders’ list is Giant, a seasonal New American casual dinner named after a Shel Silverstein poem (heart skipped a beat!). It’s casual and small, but upbeat in vibe and flavor. Go for the pastas. 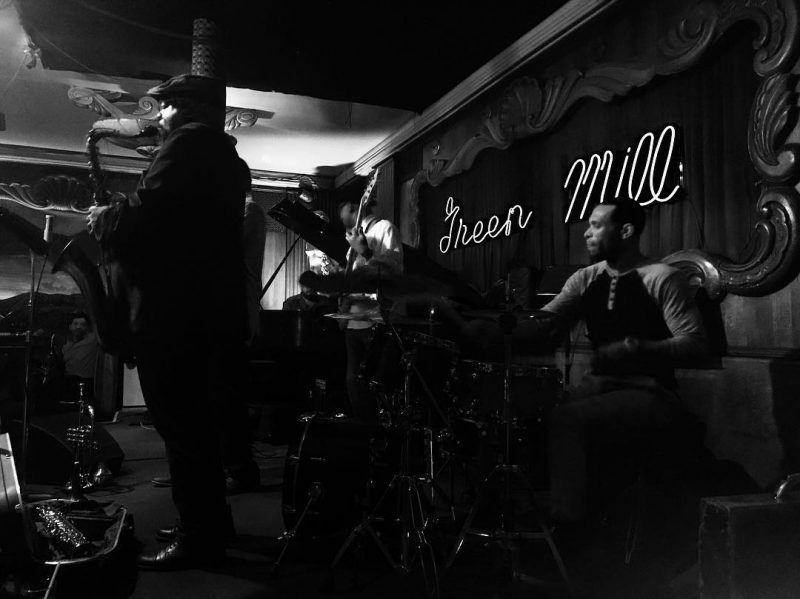 Chicago is known worldwide for its jazz history, and boy oh boy, Green Mill Cocktail Lounge is an Institution with a capital I. On the north side of town, you’ll be swinging to the notes of the best in the business, and plus, this used to be Al Capone’s favorite bar during the heyday of Prohibition. It’s a place for people from everywhere and anywhere – the music is what truly ties it all together. Another cool fact: Green Mill started the first poetry slam back in 1986, and it’s now a weekly thing! Every Sunday from 7-10pm, you can pay a $6 cover charge to see newbie poets striving to win the hearts and minds of the audience. Another night activity, and it wouldn’t be a Chicago city guide without it, is Second City. This legendary sketch and improv comedy troupe has comedians Joan Rivers, John Belushi, Bill Murray, Tina Fey, and Stephen Colbert calling it their alma mater, so they know what’s up. It’s a Chicago institution, and while we can’t promise you’ll discover the next Tina Fey, they have 11 PM shows almost every night of the week, so you may be oh-so-lucky! Surprised at how tired you are? That was a jam packed day. Monique and Katie suggest sleeping it off at Freehand, a beautifully designed hotel located in a restored 1920 Art Deco building. If you still have minor FOMO, know that the hotel’s bar The Broken Shaker is unreal in its cocktails and Wes Anderson-like in its vibe. That’s 24 hours, folks! Obviously not enough time to fully enjoy the Windy City, but you got the basics: deep dish pizza, troves of history, photogenic skylines, and more. Go and conquer the Second City, and who knows, maybe it’ll end up your number one destination. And to make sure your stuff is protected along the way, take Lemonade for a spin. Lemonade originally launched renters insurance in Illinois back in April of 2017 and more recently, homeowners insurance as well. Stay up to date on when Lemonade will be in your state at Lemonade Goes Nationwide. Lemonade just launched in Georgia, so what better excuse than to whip up an Atlanta city guide? All the spots to wine, dine, and have a fun 24 hours in the ATL, brought to you by the locals. It’s really hard to buy something that 1) isn’t a physical product, or 2) you aren’t using every day. Truth is, the best time to get renters insurance is now!